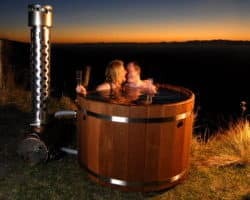 Mahootus offer hand-crafted traditional style hot-tubs suitable for today's lifestyles, be it town or country, apartment or bach. 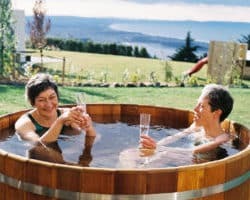 As good to look at as they are to soak in, our hot-tubs offer everyday usability and practicality with the benefit of no expensive chemicals or running costs. Simply fill the tub via your garden hose, get the temperature to your desired heat via the dual-fuel burner, then relax with a soothing soak. Mahootus hot-tubs are hand-made in the age-old coopering style. Constructed from western red cedar, the timber used in traditional soaking tubs, they offer a rich warm appearance that is complemented by contemporary brushed stainless steel hardware. 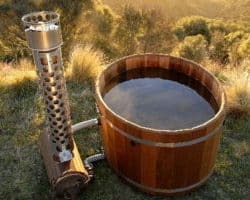 The patented dual-fuel burner heats the water to your required temperature by either wood or the slot-in LPG element (the same burner can use either fuel). That's all the power you need as there are no moving parts or pumps. No chemicals are required. Fill the tub with fresh or sea water, use it several times, then when you are finished with that batch of water, simply "pull the plug" to empty the tub. Drain onto the garden, into the stormwater system, sea, lake or wherever is convenient. Constructed using western red cedar with stainless steel hardware. Powered by patented dual-fuel burner heating system (LPG or wood). Please contact us with any questions or comments about how we may help you.